so this year can be your best year yet! When you ask for a referral you undermine the human dynamic and psychology behind why a referral happens in the first place. I’ll make sure you understand the fundamentals of referrals so you can generate them without asking and with confidence. Once you know why we don’t ask for referrals, we will turn our attention to understanding what you need to know and do to attract referrals to you. You’ll shift your mindset and realize that generating referrals without asking is easier than you think. There are a few specific foundational actions you need to take right away to build a referral growth strategy. I’ll break the actions down for you so you will be able to implement them right away in your business (as in immediately)!! While you may not know what to do to generate referrals without asking, you are open to learning how. 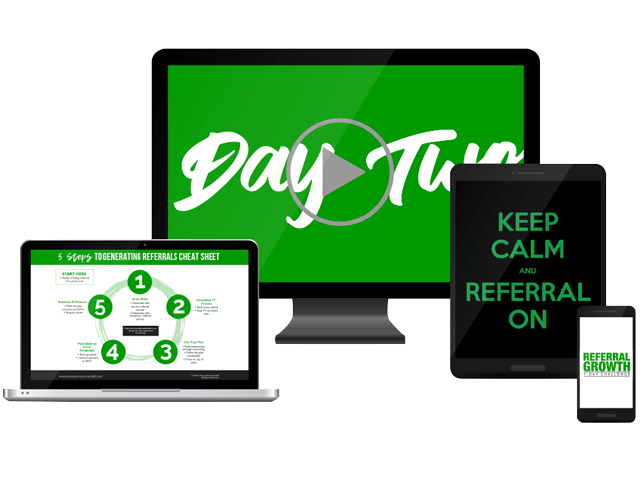 That is what this 7 Day Challenge is for… to show you it is possible to generate referrals and the steps to follow. There is no silver bullet and this is not a get rich quick scheme. You will have to dedicate time to learn what to do and then do it for referrals to actually happen. A high touch business means you have to cultivate relationships to sell your services and grow your business. Those who cultivate relationships are uniquely positioned to receive referrals. This challenge is for B2B and B2C business owners.